There's a part of every man's soul that longs to be a motorcycle-riding badass, but who wants to buy one only to have it collect dust in the garage thanks to other responsibilities? Cause you could totally afford it. Because, like, what else are all those other responsibilities about? Yeah, it's totally not about the money. For a taste of the action at a fraction, hit up Jupiter's MotoShare. Seeing a void in the market for East coast ride enthusiasts who couldn't buy a bike due to cold winters/storage space, the dude behind Jupiter decided to expand his successful LA 'cycle-time-share scheme to NYC, because John Travolta shouldn't be making movies the only one going Hog Wild. 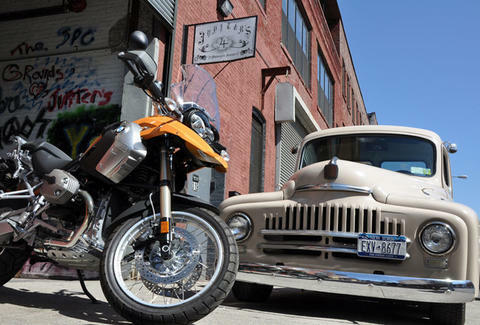 Avail in 6-month increments (with anywhere from 18 to 72 days of riding), members book their days on the website's cal, then can either swing by the showroom to pick up, or have their bike delivered on a vintage flatbed, since leaving the city should never require going to Brooklyn. Currently stocking five Beemer models, rides include the '08 R1200GS (105 hp, sport/normal/comfort/off-road suspension adjustment); the '09 G650GS, with a 3-position clutch "aggressively engineered for unrelenting performance in harsh environments"; and the speedy, tour-friendly '09 S800FT, with side storage cases & heated handlebars, a feature that if applied to your face would make your mustache ride the ultimate. Members can book their days on either coast, and should you want even less responsibility Jupiter's already established a rental service, which you're only using cause you can't plan too far in advance, what with all your responsibilities, and money. Soooo much money.